This is another episode of our new Snapshot series. This time, we have a look at Pascale Marthine Tayou’s work Tayouwood (1953). The work has been shown at this year’s Art Basel in Basel, in the Unlimited sector. This is the official description of the work: “Stepping into the video installation Tayouwood, the spectator stumbles upon strange objects and architectural forms, a poetic city of rooms, inner courtyards, and windows onto another world, a transformation of the artist’s hometown. The videos projected inside and outside bring life into the buildings, adding chaos to the construction, like that of the world. Indeed, it does not appear to be an African village, but a mix of several cultures and influences. This small world is one that Pascale Marthine Tayou has been constructing year after year, since he was a child, through his trips, encounters, and experiences. Snapshot: Pascale Marthine Tayou: Tayouwood, 2014. 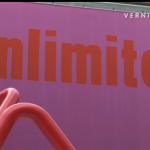 Art Basel in Basel, Unlimited sector, June 17, 2014.